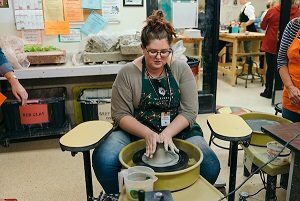 A student employee of Wheelhouse Studios leads a pottery session. The Wisconsin Union has more than 1,200 student employment opportunities and more than 50 different types of positions. We have amazing opportunities in just about anything you can think of, including but certainly not limited to social media intern, climbing instructor, event planning intern, baker’s helper, and paddling instructor. With each role, students have the opportunity to build up their resumes with real-world skills before they even graduate. Our student employees also receive discounts on food, flexible work scheduling, all-staff parties, and more. With all of these benefits, it may be no surprise to you that when we surveyed our student employees, 92 percent of them said they would recommend working at the Union to a friend or classmate. The best news of all about Union student employment: we’re hiring! Check out our available jobs here. We encourage all students to apply, including international students and those who have work-study. The leadership experiences offered through the Union are unrivaled on campus. Our student leaders plan, promote and implement more than 2,000 events that take place at Union South and Memorial Union each year. Events includes live music performances; engaging discussions on current political issues; innovative, diverse film lineups; outdoor climbing trips; volunteer service trips; and more. These leaders are part of the Union’s student-led programming and leadership board called the Wisconsin Union Directorate (WUD), which is made of up 10 WUD Committees, and six outdoors-focused Wisconsin Hoofers clubs. All students are welcome to join WUD and Hoofers. In addition to opportunities for fun and leadership as committee members, some of our student leaders, such as committee directors, receive stipends and other leadership benefits. Students can learn more here. We are also home to the Willis L. Jones Leadership Center (JLC). JLC aims to inspire students to work to positively transform themselves, their peers and their communities. Students can learn more about discovering their leadership potential and honing their leadership skills and style here. There’s a lot to love about college, but it can also be stressful. We get it! That’s why we have spaces and programming to help students relax and just be. 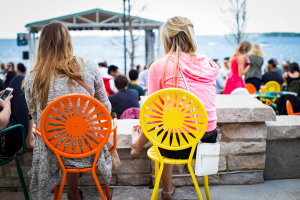 They can relax on our famous outdoor space known as the Memorial Union Terrace, catch a movie at the Marquee, play trivia at the Sett or attend one of thousands of events all year long. From bowling, to the performing arts, to yoga, to a reflection room, there’s a way for every student to unwind with the Union. Badgers can check out our full list of events happening at the Union here. There are endless opportunities for growth at the Wisconsin Union. Since this article can’t be a novel, we’ll just share a few with you. Whether through learning new skills at a job, being a student leader in one of our committees or clubs, or attending any of our more than student-led events, growth opportunities (the kind that opens us up to new perspectives and helps shape who we are) are everywhere at the Union. 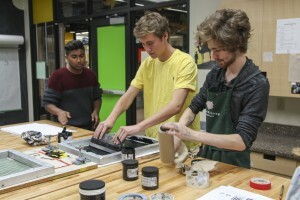 For example, we offer an open arts studio, called Wheelhouse Studios, where students can embrace their creative side. Students can also explore the outdoors with the Union through Outdoor UW and the Hoofers. Outdoor UW provides everything from yoga classes to snowshoe rentals. Rotating art exhibits in the Union’s galleries at Union South and Memorial Union also offer continual chances to consider new ideas and, in some cases, innovate art forms. More information about how to grow with the Union is available here. Whether students come to work, to lead, or to play, (or all of the above) the Wisconsin Union is a place that is meant to be enjoyed, a place where student life is truly lived, and a place where everyone can be their authentic selves. More information about the Wisconsin Union is available here.